Aston Martin DB4/5/6/Volante LHD dashboard kit . 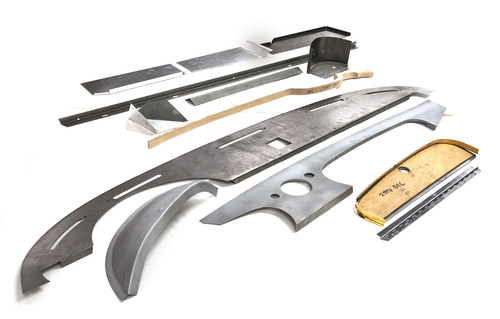 This kit has been designed by Aston Workshop and is suitable for DB4,DB5,DB6 coupe and volante models, The kit is supplied in "flat pack" format and some modifications may be required upon fitment this will vary on each individual vehicle.We recommend that the original dashboard is retained for pattern and sizing purposes and that a specialist workshop is used when attempting to fit this kit. The parts supplied will often be oversized to ensure suitablitiy for the individual car and items supplied may differ to the supplied photograph depending on vehicle model. KIT SHOWN IS DB6 VOLANTE SPECIFICATION.